Camp Nou, Europe’s biggest stadium, will undergo a €420m redevelopment. Image: courtesy of FC Barcelona. The spectator capacity of the stadium will be increased from 99,354 to 105,000. The redevelopment will also include the installation of a new roof to provide protection from adverse weather conditions. Image courtesy of FC Barcelona. A team comprising Nikken Sekkei and Joan Pascual - Ramon Ausió Arquitectes was selected through an international competition to carry out the stadium redevelopment. Image courtesy of FC Barcelona. Europe’s biggest stadium, the Camp Nou, is proposed to undergo a renovation and expansion to transform the iconic facility into a world-class venue. Located in Les Corts in Barcelona, Spain, the stadium has been home of FC Barcelona since 1957. The club announced Nikken Sekkei and Joan Pascual – Ramon Ausió Arquitectes as contractors on 8 March 2016 following an international design competition to head the renovation project. 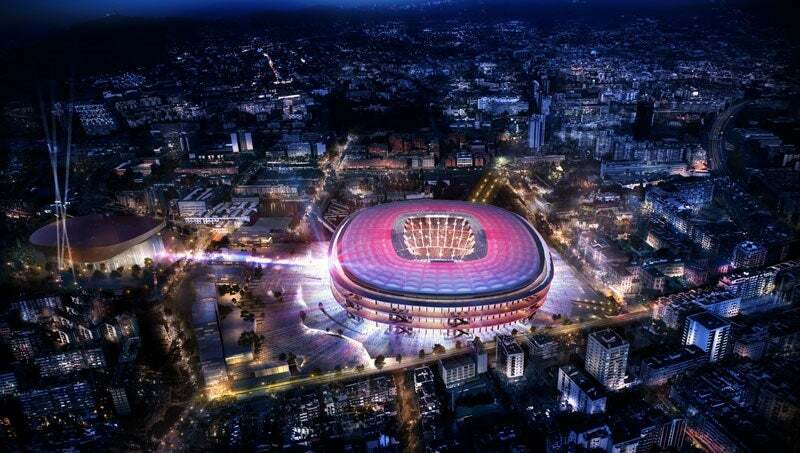 Dubbed New Camp Nou, the stadium renovation is estimated to cost €420m ($465.7m) and is part of a bigger project, Espai Barca, which is expected to cost approximately €600m ($665.2m). It also includes the New Palau Balgrana, a multi-use arena designed by HOK. Work is planned to start in 2017 with completion scheduled for 2021. Construction will be carried out in phases, with work on seating areas scheduled for the off-season, and work on inner and outer sections planned during the football season. Changes have been designed to depict Mediterranean architecture, and an open and modern public space. Designed to be environmentally compliant, the new stadium will feature an open area that will increase circulation and enable greater usage of the campus. Spaces at the stadium have been designed to be large and airy, with easy accessibility. The new stadium will comprise three main areas: the stadium itself, a 10,000-capacity Palau Blaugrana, and multi-purpose buildings. It will have large, open lobby areas that will guarantee ease of movement, and also comfortable balconies that offer magnificent views of the city. Spectator capacity will be increased from 99,354 to 105,000, while its three tiers will be retained. The first tier’s angle will raised to also improve views of the field. The second tier will remain largely unaltered with some minor changes to increase comfort. The third and top tier will be extended to the stadium’s west and will now cover the field’s entire perimeter. Seats will be covered and spectators protected from the weather. A new roof is required to have an area of approximately 47,000m². Space between the first and second tiers will accommodate ‘superboxes’ and other VIP services. An additional 3,500 new VIP seats will be added, bringing the total number of luxury seats to 5,700. To add to the viewing experience, the video scoreboards will be equipped with high-resolution digital technology with LED type systems and will be visible from all the seats along with the new screens. Space within the stadium is planned to be increased from 40,000m² to 104,000m² as part of the refurbishment. A new roof will be installed over the stadium to cover all the open terraces. The aisles will be made free of vertical connection hubs and widened to hold more supporters. The terraces will be divided into sections to provide safety for the visiting supporters. Each section or zone will have its separate entrance and passageway inside the stadium. A total of 5,000 parking spaces will be created in an underground parking lot to free up the public area adjacent to the stadium and also to make it accessible for the neighbouring areas. The media section will be revamped and relocated along with new cabins and television sets to an exclusive 2,000m² media area and a new press room. A changing room with an area of 2,000m² will be designed in a new space that will also include a 50m warm-up area, four changing rooms, medical area, access to press room and other player-related amenities. A new 340m² restaurant will be built on the new premises in the upper first tier where some of the VIP boxes may also serve as restaurants. "Sixteen escalators will be installed with a capacity of transporting 80,000 people in half an hour." The VIP area will have a direct access to reserved parking and will also feature a private circulation section with limited access that will interconnect the various VIP boxes. A 4,000m² multi-purpose room for catering, as well as social and cultural events will be built. Bars are planned to be distributed throughout in each circulation area for easy access by spectators. They will include facilities for smoke extraction and payment systems. Sixteen escalators will be installed with a capacity of transporting 80,000 people in half an hour. The perimeter of the stadium will have 50 lifts distributed throughout. Separate routes will be designated for emergencies and evacuation will be conducted through the external perimeter. Spacious horizontal circulation will be separately provided at each level and will offer necessary services same as airport lobbies. The horizontal circulations will be located behind the stands to prevent any obstruction of the field.